I’m a very happy fellow these days. You see, I’ve just solved a three-year old dilemma that’s been aggravating me every time I move cows or pigs around the barn. And all it took was accidentally setting up this panel just so. This makes absolutely no sense, I know, but bear with me as I explain in excruciating detail. Our barn is an old (built in 1890) dairy barn. This is a problem because, being a dairy barn, it is built for dairy cows. Other farmers may understand my dilemma by now, but for those of you not so well versed in the nuances of livestock, I offer this by way of explanation. Dairy cows are (generally) very docile. Historically, small dairies would fit their cows with halters or collars (where cowbells hang) that would allow the cows to be lead into their stall in the barn by the farmer. Dairy cows must be milked several times per day, and it takes a pretty gentle animal to stand still and be milked by it’s primary predator. If your cows are so docile that you can lead them exactly where you want them, then you don’t need much in the way of handling facilities (gates, chutes, alleys) to get them were you want them. But the problem is that we don’t have any dairy cows. Instead we have beef cattle and pigs. These critters, bred for their meat, are decidedly less docile. Technically speaking, they have much larger flight zones. Whereas a dairy cow would let you approach and put on a halter, a beef cow will (at best) let you barely touch it’s nose before it turns and flees. Some beef cattle, like those raised out west with little human contact, have flight zones that are best measured in football fields. 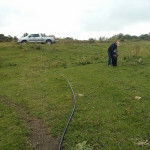 So, to make a long story short, with beef cattle and pigs one needs to have handling facilities that are up to the task of moving, sorting and confining small herds of skittish livestock. These facilities should be more than a collection of gates, chutes and alleys too. Any decent handling facility needs to “flow.” That is to say, the livestock need to move through the handling facilities without a lot of yelling, crowding or other goofy intervention by the farmer. Good flow leads to lower stress on the animals (and by extension lower stress on the farmer) which leads to better meat. 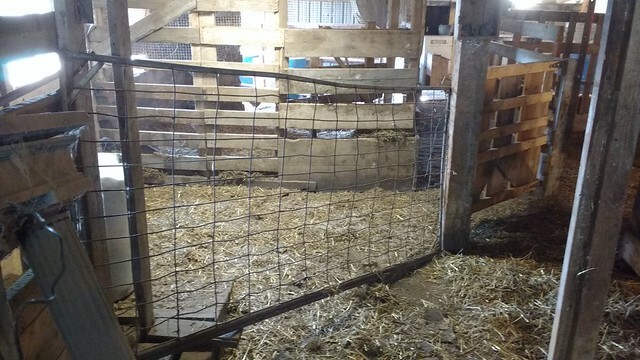 As I’ve noted before, there are tons of resources available about how to design handling facilities that are perfectly suited for moving livestock of all types. Lots of these plans, especially the ones that Temple Grandin has come up with, should flow livestock through with minimal stress. Unfortunately (as I’ve also noted before) the nice little diagrams and layouts they give bear little resemblance to centuries-old dairy barns. 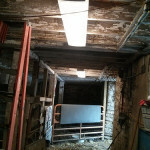 So those of us who are rehabbing old barns are left out in the cold. It’s easy to see what the best facilities should look like, but impossible to see how those facilities will fit in any preexisting structure. 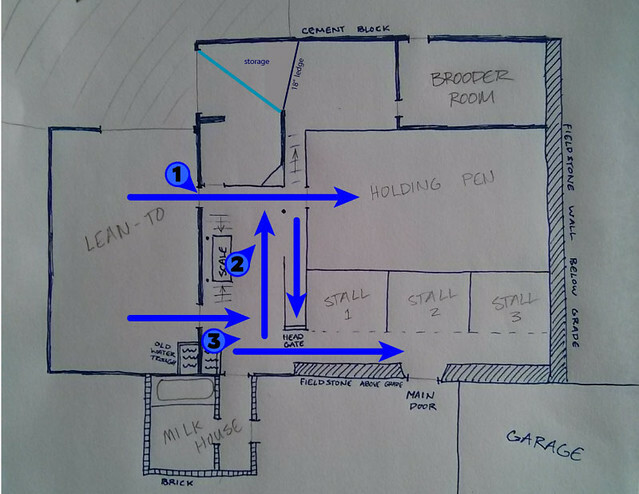 Thus the three year conundrum: How to fit usable handling facilities in our existing barn? Here’s what I was thinking about for the past three years. Please excuse the fact that my hand-drawn barn layout isn’t quite to scale. Either way we can see that following the traditional chutes & alleys approach is a complete train-wreck. The biggest problem (#1) being that the straightest path to the holding/sorting pen is through a door that is smack-dab in the middle of a wall. For humans this is not a big deal. We know what a door is and how to approach one. Livestock, on the other hand, are not big fans of doors and will go to great lengths to avoid them unless they’re placed in a corner. Sure, you can more easily herd cattle through the second door back in the corner but there you will run into problem area #2, the big fat middle of everything that is too short, too wide and just too in-the-way to put a chute. Even if you did manage to shoehorn a chute in the middle of all this mess you’d only create a bigger mess at point #3 where four of your hypothetical chutes collide into one epic mess. Even if you did manage to build facilities like this it would ruin the everyday usefulness of the barn because you’d never be able to move through the barn without opening and closing a couple dozen gates. That’s not something I’m interested in trying with a full bucket of feed in each hand. And this all brings us back to the accidentally placed gate. That one gate (placed diagonally across a “chute”) got me thinking about things a little bit differently. What if there were no chutes? What if we thought about funnels instead? 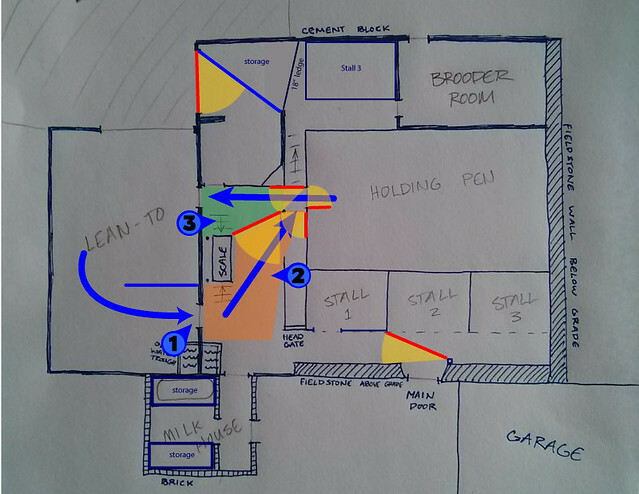 This layout solves nearly all the problems inherent in the barn’s original design. First (#1) we can funnel the livestock into the far door where they will go into the barn of their own volition (with just a little bit of pressure from me). Inside the barn we get to the first proper funnel (#2) that leads into the holding/sorting pen. The beauty of this setup is that it works on the same principles as the vaunted Bud-Box. The basic idea is that cattle like to turn around and go back out the way they came in. Better yet, when they leave the holding/sorting pen, the way out is also a funnel (#3) which leads to an almost immediate release of the pressure that cattle experience from being in close confines. Area #3 also doubles as a smaller sorting pen for the pigs. Pigs, being smaller than cattle and having smaller flight zones, need a smaller sorting area. As with anything on the farm, it may look good on paper, but the proof is in the pudding. As such, I’m happy to report that I’ve now sorted cows and pigs through the barn with the new “funnels” setup and it works SO MUCH better than anything else I’ve ever tried. Setting it all up is many times faster and easier than the old way, which is a lot easier on me. The funnel approach is also much less stressful on the cattle. 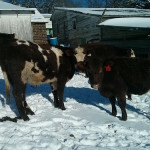 There is hardly any balking at going in the barn, and even the most skittish cows will walk out of the barn instead of running (a sure sign of low stress). Happy accident, happy cows, happy pigs, happy farmer.